THE BASIC PROCEDURE is simple. 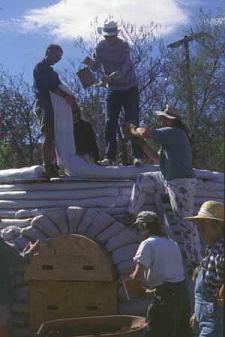 The bags or tubes are filled with a suitable pre-moistened dirt right on the foundation, laid in a mason-style "running bond." We use #10 coffee cans for scooping and filling. This eliminates any heavy lifting. After a row of bags has been laid, the row is compacted with hand tampers. 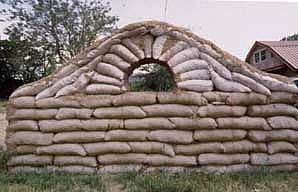 We lay two strands of long-barbed 4-point barbed wire between every course which acts as a "Velcro mortar" cinching the bags in place. 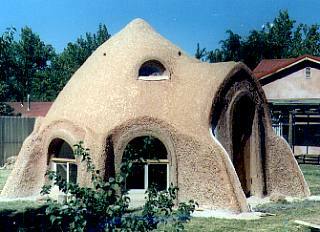 This also provides tensile strength while allowing for the rows to be stepped in to create self-supporting corbelled domes [there is realistic concern about saturation and collapse of unstabilized materials in wet climates ed] and other unusual shapes. Round structures are guided by the use of a revolving compass. 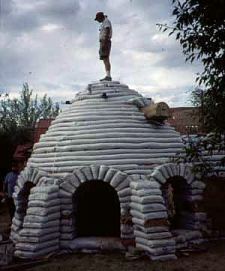 Arched openings are incorporated with the use of removable plywood forms until the "keystone" bags are tamped into place. 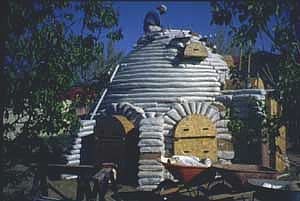 The bags we used for our construction are woven polypropylene "misprints." The companies that manufacture these bags sometimes have imperfections or mistakes in the printing process that render them unsuitable to their clients. Rather than throw these bags away, the manufacturers will sell them at a reduced cost. A comprehensive list of bag manufacturers can be found in the Thomas Register at your local library. Our favorite manufacturer has been Cady Industries in East Memphis, TN. 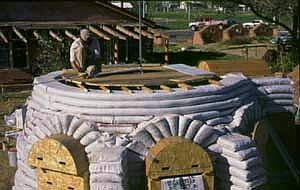 We are currently involved in documenting material for a "How to" manual and inspirational video on F.F.R.E construction (go ahead, pronounce it free construction!). 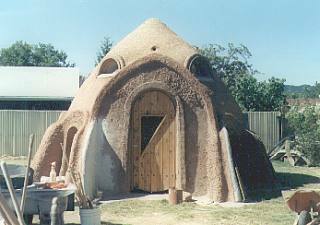 We offer workshops in design and hands-on construction techniques utilizing Flexible Form Rammed Earth architecture as an aid to creating affordable and earth-friendly housing. For more information, consultation or workshop schedules contact: Kaki Hunter & Doni Kiffmeyer, OK OK OK Productions, 256 East 100 South, Moab UT 84532; okokok@lasal.net.